Holiday Special - Price just reduced. This open and airy home is move in ready & waiting for you. Entire home has new paint, carpeting & flooring. Entering the home you will have a formal living & dining room. Continue to the kitchen & family room combo. Family room has a gas log fireplace, an adjoining playroom/office & overlooks the large level back yard. Spacious kitchen w/beautiful granite counters, tile back splash, custom cabinets, breakfast bar & eat in kitchen area. Upstairs has 4 large bedrooms, a loft, large guest bath & laundry. The over-sized Master has two WIC's & a separate dressing/reading area. Beautiful master bath w/an extended shower & separate soaking tub. Dual sinks & lots of storage. Great neighborhood w/pool, club house & walking trails. 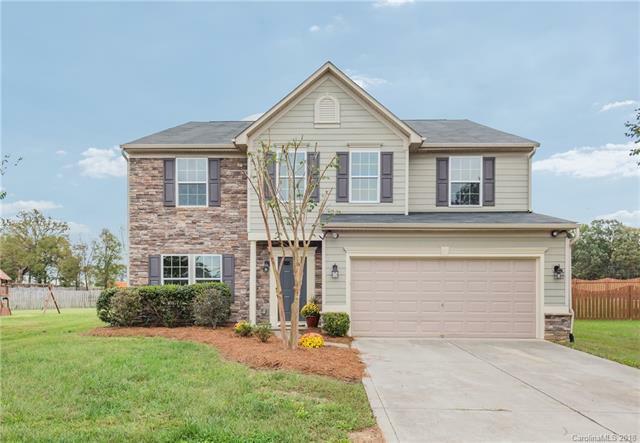 Quick-access to desirable Union County Schools which are located less than 2 miles from the community. New 74 Bypass opening soon. Green area being developed behind home to include pond - No backyard neighbors.